URBANA, Ill. – The USDA National Institute of Food and Agriculture has announced a grant for $1 million to support research led by a University of Illinois scientist. The research will address the need for better-adapted and higher-yielding biomass cultivars ready to plug into the biofuel supply chain in the United States. “Currently, there is only one genotype of Miscanthus x giganteus (‘Illinois’) available in the U.S. for farmers to grow as a biomass crop,” says Erik Sacks, plant geneticist in the Department of Crop Sciences at U of I and principal investigator on the grant. “This cultivar is insufficiently winter-hardy in the northern Midwest, and flowers too early in the southern U.S. to achieve high yields. “If we don’t have the right varieties, that’s going to be a really limiting factor in our ability to produce the biomass feedstocks needed for conversion to bioenergy or other bioproducts. The varieties have to be regionally adapted,” he adds. 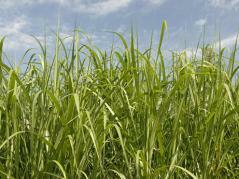 Sacks and collaborators at U of I, Alabama A&M University, and HudsonAlpha Institute for Biotechnology will breed new miscanthus cultivars from an extensive repository of plant materials collected around the world. They will also field test already developed hybrids that show promise for both cold tolerance and high yields. An important aspect of the work is the use of genomic selection tools, which will allow the team to make decisions about desired traits without having to grow plants to maturity. That process, on which traditional plant breeding is based, is extremely time-consuming and requires a lot of trial-and-error. “We will use a statistical model that incorporates information from the miscanthus genome to predict phenotypic values, such as winter hardiness, flowering time, and biomass,” says Alex Lipka, assistant professor of biometry in the Department of Crop Sciences at U of I and co-investigator on the grant. The grant also includes an educational component for high school, undergraduate, and graduate students. Investigators at Alabama A&M and HudsonAlpha will administer a short course on genomics, and graduate students will be funded on the project. Ultimately, the team believes the combination of faster breeding cycles, better-adapted cultivars, and training opportunities will overcome the hurdles the biomass industry faces today, resulting in a stronger bioeconomy in America. Additional co-investigators include Kankshita Swaminathan and Sara Cooper of HudsonAlpha, and Ernst Cebert and Venkateswara Sripathi in the Department of Biological and Environmental Sciences at Alabama A&M University.